EAGLE, Neb. 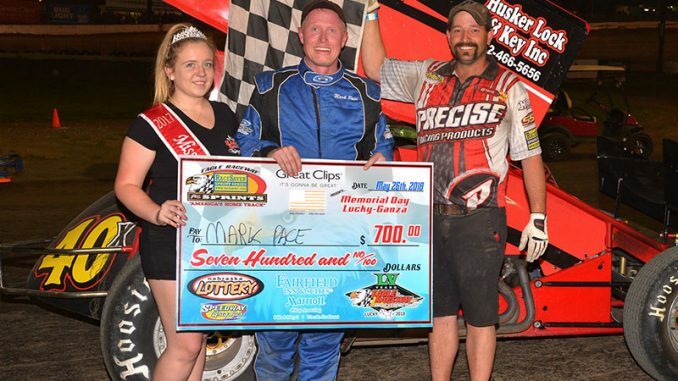 (May 26) – Mark Pace was scored first every time around the track in winning his first IMCA RaceSaver Sprint Car feature Saturday at Eagle Raceway. Joey Danley, Toby Chapman and Mike Boston rounded out the top four. Jeff Ware and Shawn Harker both won for the third time in four Valentino’s IMCA Hobby Stock and Purdue University IMCA Northern SportMod outings, respectively. Jordan Grabouski paced the Runner Freight IMCA Modified main while the ATV Motorsports IMCA Sport Compact finale saw Jeff Creek capture his first victory since taking a while away from rac­ing. 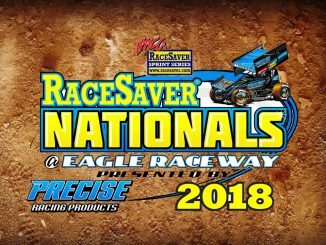 One hundred and sixty-three cars saw action at Eagle and following the regular features, Pro Rol­offs put on a special match race. The top two in points in all regular weekly classes raced for a top prize of $1,000. Racing was handicapped by the number of laps they had to run. Sport Compacts ran 11 laps, Hobby Stocks ran 12 laps, SportMods ran 13 laps, Modifieds had to make 14 circuits and the Sprints had to complete 15 laps. All the cars competed at the same time, navigating the same traffic. Zach Bohlemeyer’s 24Z Sport Compact took home the big money.